This Four Winds Class C gas motorhome is the perfect traveling companion for those who travel with larger groups of people. This model features a full-wall slide that opens up the interior and allows you to bring family and friends for an exciting journey. Your kids will adore the set of bunk beds towards the rear of this coach because of the two 15.5" LED TVs that have been included. There is also another bunk over the cab with a 40" TV that your guests can call their own, and since the master suite comes with both a queen-size bed and a 32" TV, everyone will have their own spot to watch a movie at night. 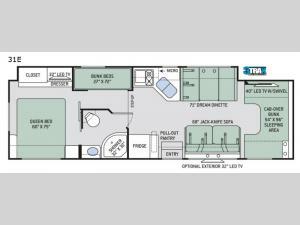 With any Four Winds Class C gas motorhome, you will enjoy the ease of driving and the affordable price. On the interior you will find residential vinyl flooring, high-sheen cabinetry with nickel finish hardware, and laminate countertops which make it easy to clean after a weekend getaway or an extended vacation. The stainless steel bathroom sink and foot flush porcelain toilet provide added convenience every where you stop, and the skylight above the shower is an exceptional feature that brings in the morning sunlight and brightens up the interior. Basement Storage 55.7 cu. ft.